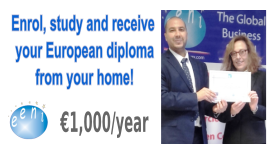 Syllabus of the Online Course (Subject): European Union-Egypt Association Agreement. Learning materials in or Unión Europea-Egipto Union européenne-Égypte União Europeia-Egito. Egypt has an Association Agreement with the European Union within the Euro-Mediterranean Partnership (EUROMED) framework. Egypt is also part of the European Neighbourhood Policy. Cumulation. 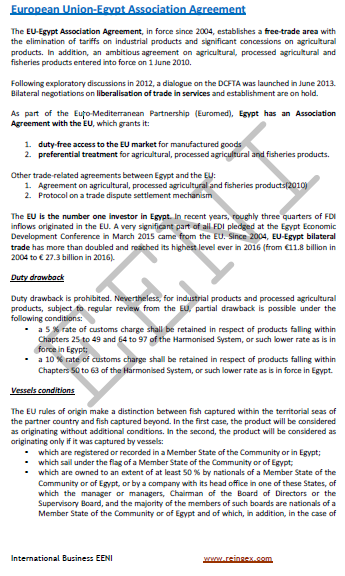 The EU-Egypt Association Agreement allows bilateral and diagonal cumulation. All the countries of the European Union (Germany, Austria, Belgium, Bulgaria, Croatia, Cyprus, Denmark, France, Slovakia, Slovenia, Spain, Estonia, Finland, Greece, Hungary, Ireland, Italy, Latvia, Lithuania, Luxembourg, Malta, the Netherlands, Poland, Portugal, the United Kingdom (BREXIT), the Czech Republic, Romania, and Sweden) are beneficiaries of the European Union-Egypt Association Agreement. Egypt belongs to the Economic Area of the East Africa (Islamic and African Civilisation).